I knew it would take a long time but my patience has finally been rewarded! 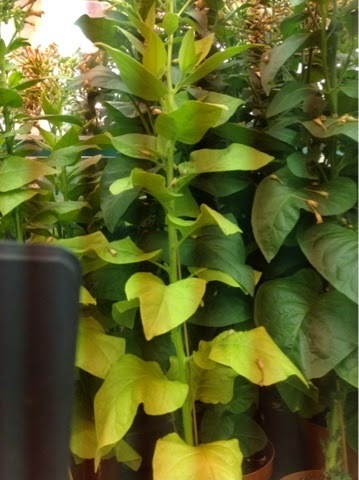 My incredibly tall tobacco plants, marvellous though they are, were only brought into being for one purpose: so that I could infect them with a Striga gesnerioides, the parasitic plant that is the basis of my ohD project. 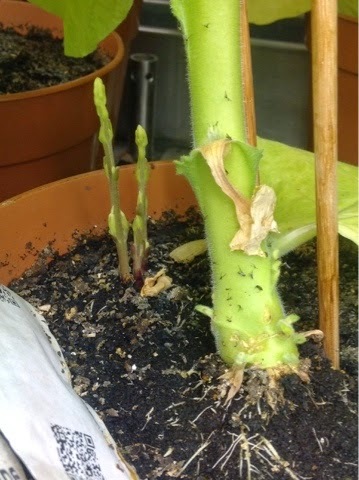 Because tobacco is such an accommodating host, the parasite should, in hone org, send up lots of shoots and flowers that will produce enough seed for me to complete my project! But these things take time. So, after transplanting my tender tobacco seedlings into pots filled with parasite seed infected soil, all I could do was wait. Meanwhile, I carried on with my experiments in the lab, all the time using up my rapidly dwindling supply of Striga seed... The tobacco rocketed up to the ceiling, produced wonderfully pretty pink and white flowers and gave me a lot of satisfaction in admiring how tall they were... But no sign of the parasite. I began to worry... If this didn't work, what could I do? Did I have time to find a new species to work on and to become familiar with its peculiarities? The first shoot of Striga gesnerioides! So a happy day for me! Later my supervisor came down to see them ( unfortunately she is often so busy that I have to photograph my plants on my iPad and show those to her in meetings) and pointed out another clear sign of infection - the infected plants are noticeably more 'yellow' than their non- infected counterparts.... Can you spot the difference? Thank you so much for reading and for your good wishes! It takes HOW MUCH to grow a lettuce?!!! !